We understand and respect the pride of boat owners, and we take the transport of their vessels very seriously. Our drivers are experienced, careful and courteous. Insured and with the right equipment to move your boat over land. Web Site Snapshot: If available, above is a snapshot of the Marine Movers web site at http://www.marine-movers.com as it appeared when this site was added to the directory or last verified. 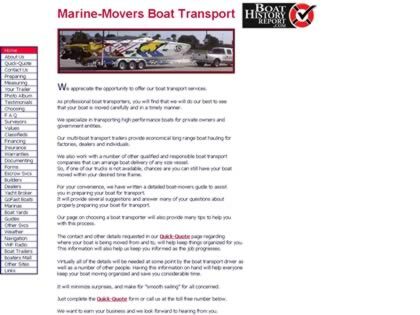 Please Note that Boat Design Net has no involvement with the above web site; all content and images depicted in the above thumbnail are the property and copyright of Marine Movers unless otherwise noted on that site. Description: We understand and respect the pride of boat owners, and we take the transport of their vessels very seriously. Our drivers are experienced, careful and courteous. Insured and with the right equipment to move your boat over land.